Pages I have always been interested in rabbits and after adopting two rabbits in early 2012 my addiction grew. These pages are here for quick reference and storage of information, most are a mishmash & hodgepodge of info. They are of random topics that I wanted answers to or found very interesting. I hope you find some of the Oryctolagus cuniculus info useful. If your rabbit is sick, or you think they might be sick, see a rabbit savvy Veterinarian. These pages are here for info storage & reference purposes only, on subjects that I have found interesting. 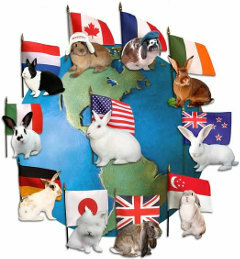 If you are looking for other rabbit topics, a great place to start is at the . Megacolon (MC): Some rabbits with the (En/En) English spotting gene can have a "predisposition" for megacolon. They are mostly white with light spotting on the body, circles around the eyes, and a broken nose butterfly. Any breed of rabbit that inherits two of the dominate English spotting genes (En) can possibly get this syndrome. The page has all of information I have collected on the MC. If you think your rabbit has MC please take him/her to see a rabbit savvy Veterinarian! Megacolon info page. A Rabbit's Vision. What can they see? I was interested in how much my rabbits could see. The information is from many studies, books and webpages. 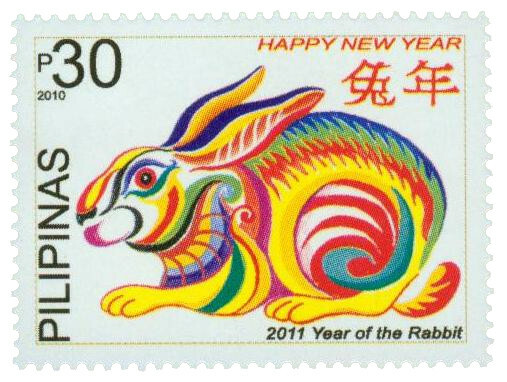 I was not sure if rabbits had any depth perception or could see any color... yes & yes. The page is a mishmash - hodgepodge of information on a rabbit's and some human vision, it answered most of my questions. Rabbit's vision info page. Metacam (Meloxicam) is a NSAID pain relief medication. Based on the latest studies and papers vets may be under and nonincremental dosing with rabbits. The page has general information on Metacam, links to the latest studies, and calculators to help figure out what dosages your rabbit is taking to compare to the latest studies. Metacam info page. Dewlaps: "A dewlap is a longitudinal flap of skin that hangs beneath the lower jaw or neck of many vertebrates." "The dewlap is found mainly on female rabbits, although, in certain breeds, the males are also allowed a small one. Its purpose is to provide another area for the doe to pull fur from when she is making her nest for her kits" It seems to be related to bigger breeds (genetics), but smaller ones can also get it. Overweight rabbit (even males) can get them. Dewlap information page. Mary E. Cotter & Amy Sedaris - Introduction Videos to Rabbits: Howcast.com (and now Youtube) hosts 49 Videos totaling 1.4GB. There are 3 hours, 10 minuntes of videos (enough to fill 3 DVDs.) These are a great resource for basic rabbit information. On Howcast.com & Youtube there is no real order to the videos. I did a quick page to sort the videos into 3 groups and some basic order, along with other information surrounding the hosts & videos. "How to Take Care of a Pet Rabbit": Mary & Amy's rabbit info videos. Wood Stove Fuel Pellets: Wood pellets can be a great replacement for pet litter and they can save you a lot of money. There are a few things to look for before you buy stove pellets. Number one is to make sure they are safe... no accelerants, chemicals, etc., added. Check to make they are rotary drum or kiln dried, this will help remove the phenols. Make sure your rabbit does not think they are candy. The pellet page has a few details on some brands of pellets, along with information from the manufactures via email. Wood stove pellet page. Kinenchen's Rabbit Guides: Kinenchen from /r/rabbits has made a number of great guides that have a lot of rabbit information in them (with pictures). I put a quick index page together for them. Topics include: Guide to bunny poops, What's so special about relationships between rabbits?, Drugstore Remedies for Common Bunny Problems, Quick Tips for Before and After Surgery, At Home Care Guide for Elderly Bunnies, How do I get my rabbit to like me?, Handling your Rabbit, Why proper flooring is important for your pet rabbit, Why is my bunny acting terribly? & Why should I spay or neuter my rabbit? Kinenchen also has two works in progress: Guide to Bunny Pee & Is my bunny sick? Kinenchen's Quick Guide Index Page. /r/rabbits Gift Exchange: After I joined /r/rabbits, I signed up for the gift-exchange and had no idea what to send, so I threw this page together. If you are interested in participating and wondering what types of gifts have been given you might check this Gift Exchange example page. /r/rabbit Contests: "The moderators have considered that having reoccuring community contests would be a fun idea, so let's see how this goes!" All images & pictures © of its respective owner(s). If you are interested in participating check the /r/rabbits Contests page. Page hits: 956 since September 3rd, 2012. These pages are not kouneliophobia friendly.